Babati District R4D platform meeting in progress (photo credit: IITA/Catherine Njuguna). 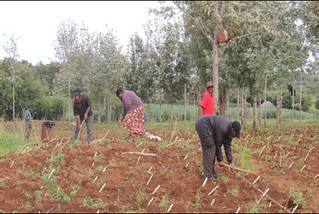 A research-for-development (R4D) platform established by the Africa Research in Sustainable Intensification for the Next Generation (Africa RISING) program in Tanzania’s Babati District is already contributing significantly to adoption of new and sustainable farming technologies in the region. Not only is the innovative platform proving to be useful in stimulating learning and innovation about productivity and nutrition, it is also opening up possibilities for farmers in Babati to view farming as a business activity that can generate significant income. Babati District in north-central Tanzania has a unique agro-ecological and socio-cultural diversity. The region is a predominantly agro-pastoral area where crops cultivated range from simsim, cotton and rice in the drier northern plains, to extensive intercropping of maize and pigeon-peas in the intermediate zone around Babati town. Wheat and Irish potatoes are also cultivated within the district in the cooler and sub-humid environment of the Rift Valley escarpment. Since April 2014, Africa RISING has organized regular stakeholder meetings in the district to initiate and support agricultural intensification activities. During these meetings, farmers and local extension workers team up with researchers, NGOs, policymakers and the private sector to discuss priorities for the coming cropping seasons and broader issues on land management, market access and capacity building for the next generation of farmers. The farmers, who are expected to be the biggest beneficiaries as the influence of the platform grows have equally expressed their excitement about it. ‘I hope this platform can stimulate us [farmers] to visit each other for knowledge sharing,’ says a female farmer during one of the recent stakeholder meetings organized by the R4D platform. Beyond promoting the adoption of new technologies, the platform has also played a major role in creating a mechanism for conflict resolution, especially in sharing the scarce natural resources available. 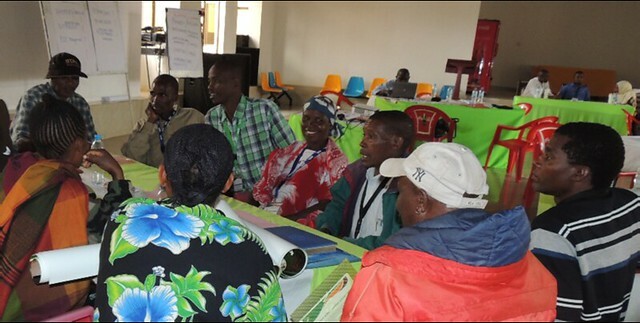 In meetings organized through the platform, farmers often also discuss emerging conflict issues relating to research and the establishment of trials within the area. This is an important practice because it ensures that the communities own the ongoing research initiatives. ‘We want transparency in the planning of research activities before they start, particularly the selection of farmers by extension agents’ notes one of the farmers. But the positive impact of the R4D platform isn’t only felt by farmers. Other stakeholders like policymakers and private sector stakeholders believe the platform will help in identifying and accessing markets and in providing trainings for farmers on value addition for their products so that they can increase their income. ‘In this way, the platform will help farmers engage in farming as a business,’ said an extension worker involved in the platform. Written by Per Hillbur. Tags: africa rising, Babati, innovation platforms, R4D. Bookmark the permalink. Previous post ← Think food, but think fodder too!